Rewind five years and face masks were more about pampering than their skincare benefits. Fast forward to now and things couldn't be more different, with face masks for every skin concern imaginable, multi-masking a huge new trend and the once pampering treat being a part of a lot of people's skincare routine. While there's no doubt these are all signs of a progressive skincare industry that I myself take advance of, I often like to opt for more simplistic less targeted everyday face masks that I'm able to use often and as a true pampering treat to achieve glowing skin. Below I'm sharing five of my favourite everyday face masks that benefit from soothing non-drying formulas, feel ultra comfortable on the skin and leave the complexion calm, restored and bright. These masks also work on all skin types! Fresh is a skincare brand you can rely on to soothe and nourish the skin with the real rose face mask being a dream for all skin types. The unique gel formula is infused with real rose petals along with cucumber extract and aloe vera gel for a truly soothing and cooling experience that is felt as soon as the mask is applied to the face. While drier skin types can really benefit from massaging the gel formula into the skin using it in place of a moisturiser, all other skin types also benefit from this wash-off mask within 5-10 minutes, leaving the skin looking more supple and healthier. Fresh can be found online via John Lewis but is now available at World Duty-Free Heathrow Terminal 3! Ideal for: Everyday masking, stressed out skin, sunburn and a dose of hydration. After a decade of Lush fans going crazy for the fresh face masks, the handmade cosmetics brand finally came out with a new range just last year. Meet the self-preserving yet still fresh jelly face masks. The range of five face masks consists of Bunny Moon, The Birth of Venus, Just to Clarify, 1000 Millihelens and Fomo and are a lovely pampering treat for all skin types. So far I've tried both Just to Clarify (a juicy orange mask perfect for brightening the skin) and Fomo (a floral rose mask ideal for soothing and balancing) and I pretty much love them! The jelly texture when pinched out of the pot may seem like it won't spread over the skin however when rubbed between dry palms it effortlessly turned to a cream mask making it easy to apply. As these masks don't set/dry they are comfortable on the skin and when washed off give smoother brighter skin. Ideal for: Lush face mask fan that want a longer lasting mask (they last 3 months! ), morning masking before makeup, a girly night-in, plumping up the skin. 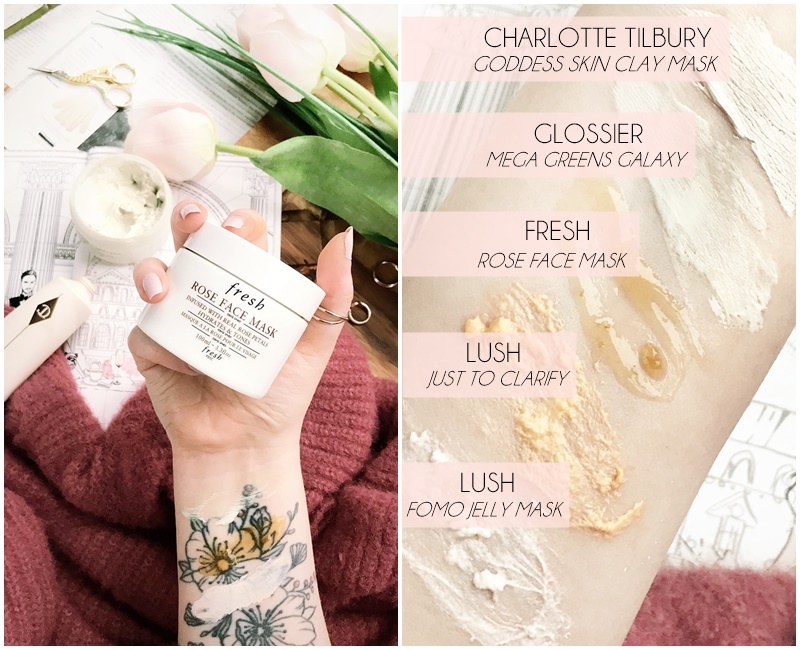 If you are looking for the ultimate everyday face mask then you should look no further than Charlotte Tilbury's non-drying clay mask that is beyond delicate. With a smooth creamy formula that doesn't dry and smells like a bunch of fresh blooms, I knew of my first application of this mask that it would be different to all other clay formulas I have previously tried. Infused with sweet almond and rosehip oils this clay mask feels like one of the most balanced formulas I've tried. Smoothed over the skin and left for 10 minutes the mask gets to work drawing out impurities, hydrating and plumping and even diffusing fine lines to give an all-round fresh glow. While I love to apply this to tired skin, sitting back breathing in the fresh floral scent, it also works wonders as a skin prep mask when you want your skin to look it's best, making foundation and makeup apply a dream. Ideal for: Pre-makeup, spring skincare, a luxury treat, balancing out the skin. Described by Glossier as a juice cleanse for your face this is a soothing mask that I adore. Made with simple, natural ingredients, the Mega Greens Galaxy Pack balances pores (never stripping or drying) while helping to calm skin. Using the gentlest white kaolin clay, this cleansing face mask detoxifies by drawing out excess oil and impurities leaving the skin feeling balanced, fresh and healthy! With a leafy clay scent, this is a mask that stands out from all the rest. Much like the above clay mask from Charlotte Tilbury this also doesn't dry down but in fact feels cool and balancing on the skin making it more of a treat than a treatment While this is suitable for all skin types and can be used as much as you wish I feel the results are best suited to skin that's stressed out and in need of some TLC. My only mild dislike it that is contains some sparse exfoliation grains that I simply don't see the need for as this isn't an exfoliating mask, nor works as one. While your favourite face mask may exfoliate your skin to perfection or clear out your pores, there's should always be room in your bathroom cabinet for a mask that soothes and nourishes the skin. These masks are perfect as a pre-makeup treatment as the never leave the skin red and only provide a hydrated base for makeup to be applied onto. Or as a skin (and mind) calming treat!